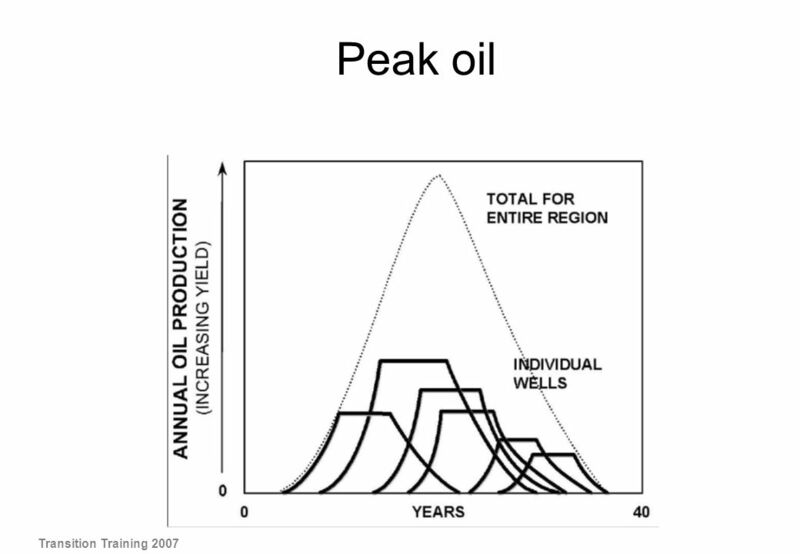 Peak oil Transition Training 2007. 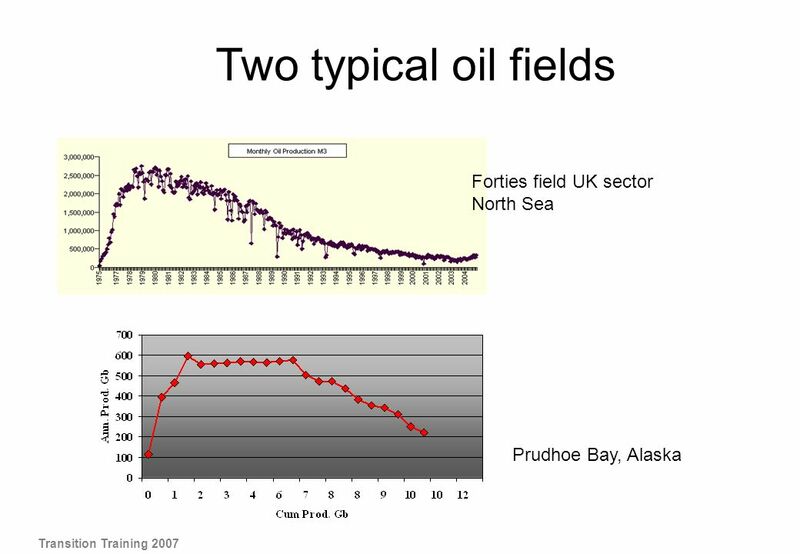 These two large oil fields illustrate the basic dynamics of oil production: A steep initial increase, a production plateau and then a slow but irreversible decline. Once the peak is past there are many techniques and technologies that can brought to maximise the declining output, but it is a losing battle and production will never return to it former levels. 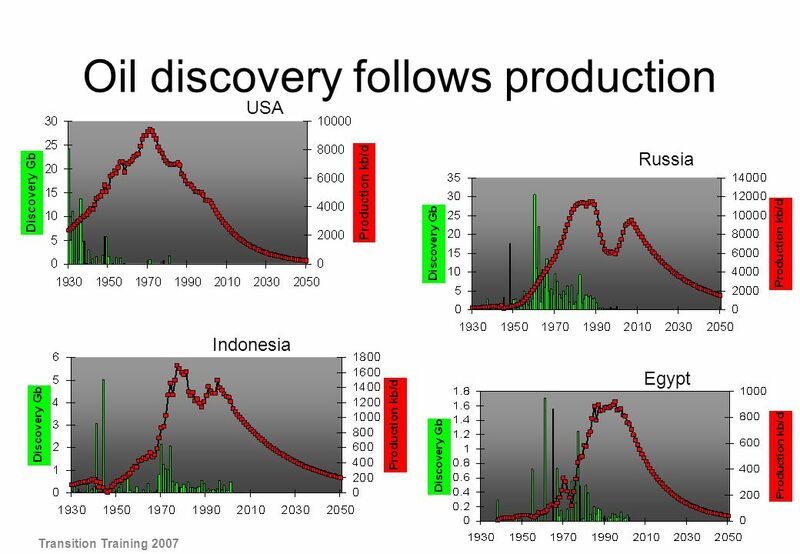 Oil production peak follows oil discovery peak, usually years later. This is the time it takes to get production going after the initial finding. 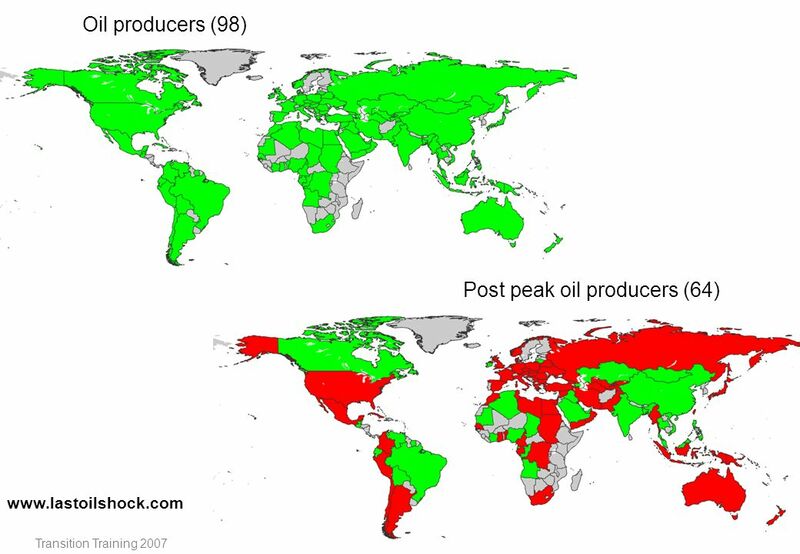 In country after country and oil province after oil province the pattern is broadly the same – four examples are shown of countries that have peaked. Globally we are now discovering 1 barrel of oil for every 5 or 6 that we use. When will it happen? 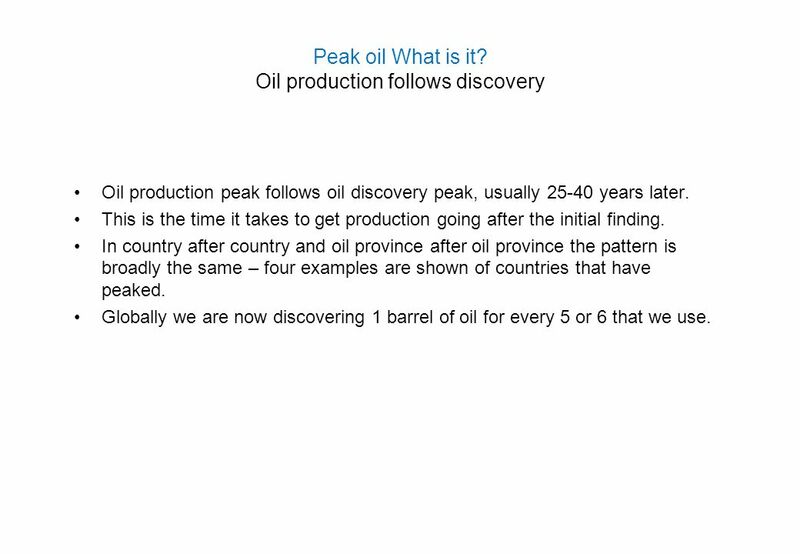 Global oil discovery, production, and demand To produce oil you first have to discover it. World discovery peaked in the late 1960’s and has been falling ever since, and despite rapidly improving and sophisticated, technology, there is no prospect of it ever increasing. At the same time production has been rapidly rising. 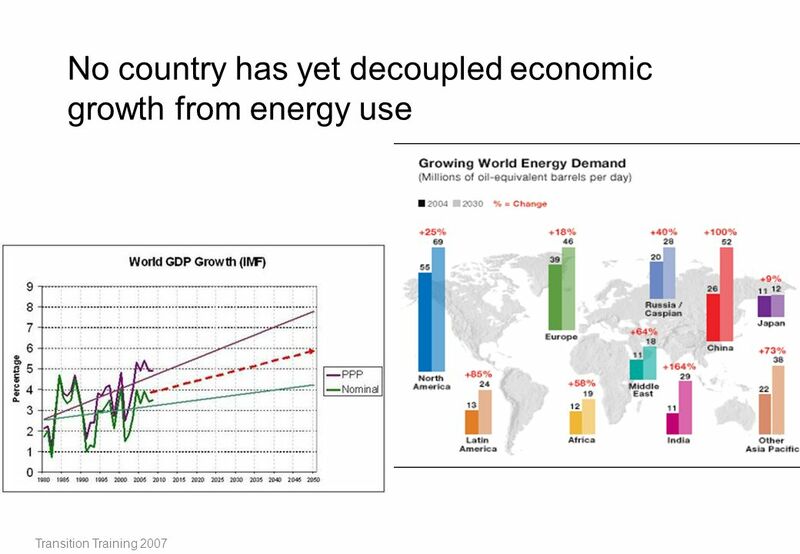 Demand is projected to go on rising, (with production failing to keep up), especially in rapidly industrialising countries like China and India, and is leading to rapidly rising oil prices. 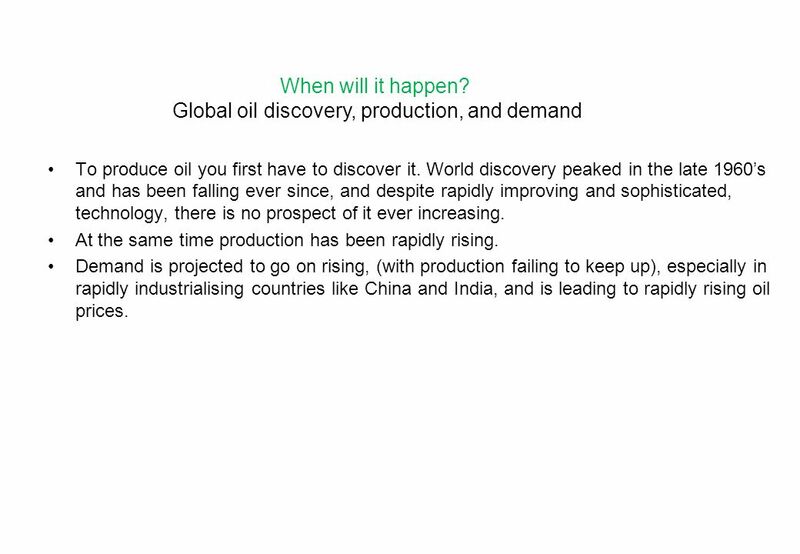 This slide looks at the historical data and the likely projected supply demand and discovery. The key thing is rapid rise of demand coupled with decreasing supply, and ever lower discovery. Oil production has hit a plateau at around 85 million barrels per day for nearly two years with no signs of it increasing, despite the increased prices and more being spent on exploration. 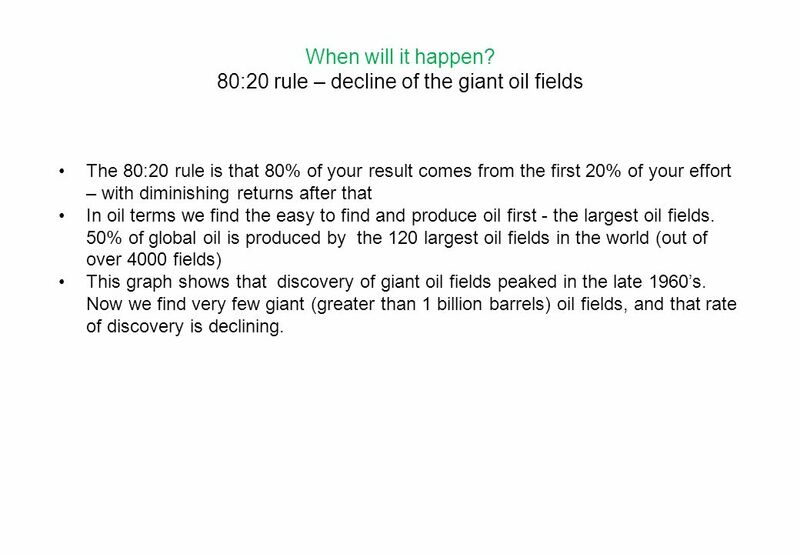 The 80:20 rule is that 80% of your result comes from the first 20% of your effort – with diminishing returns after that In oil terms we find the easy to find and produce oil first - the largest oil fields. 50% of global oil is produced by the 120 largest oil fields in the world (out of over 4000 fields) This graph shows that discovery of giant oil fields peaked in the late 1960’s. 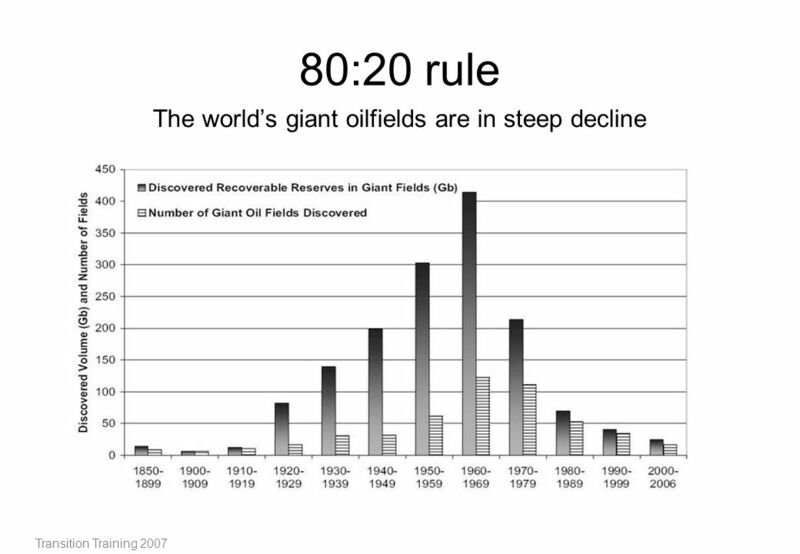 Now we find very few giant (greater than 1 billion barrels) oil fields, and that rate of discovery is declining. Additional points We have extracted the highest quality oil first – because it is worth more and is easier to produce it gives the highest return on investment. Building oil infrastructure is very expensive. Producing from a large field is much more profitable than a small field. 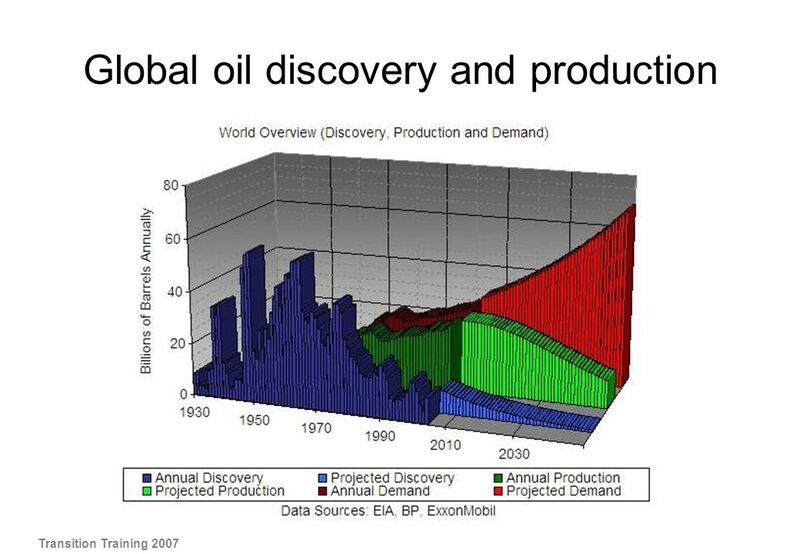 This is the economic factor behind the physical geological fact of declining production from declining discovery. 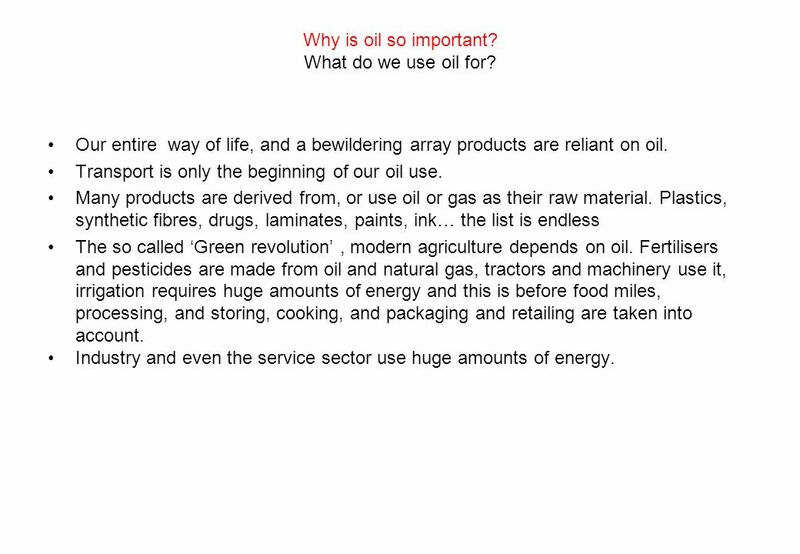 14 Why is oil so important? It is frightening how dependent we are on fossil fuels. We have only begun the move away from fossil fuel energy. 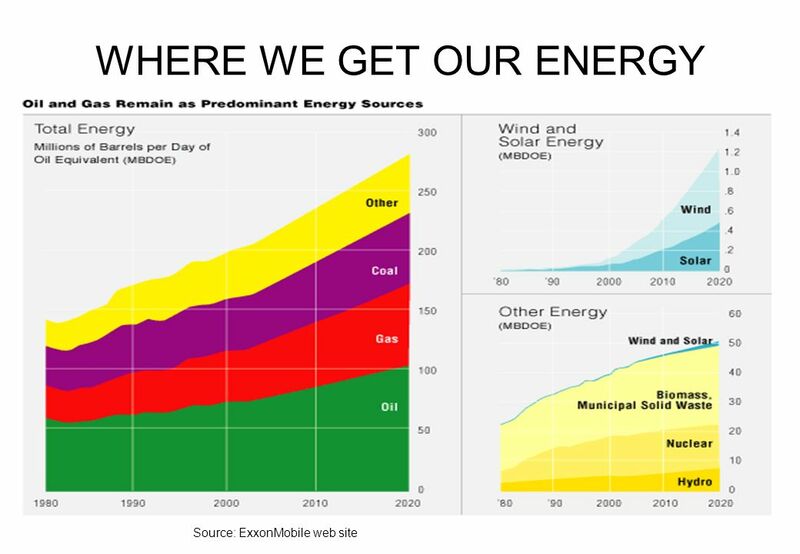 Even if we were to double the amount of energy we get from renewables, and then double it, and then double again, which would be a heroic achievement, it would still only create 3% of energy requirements. 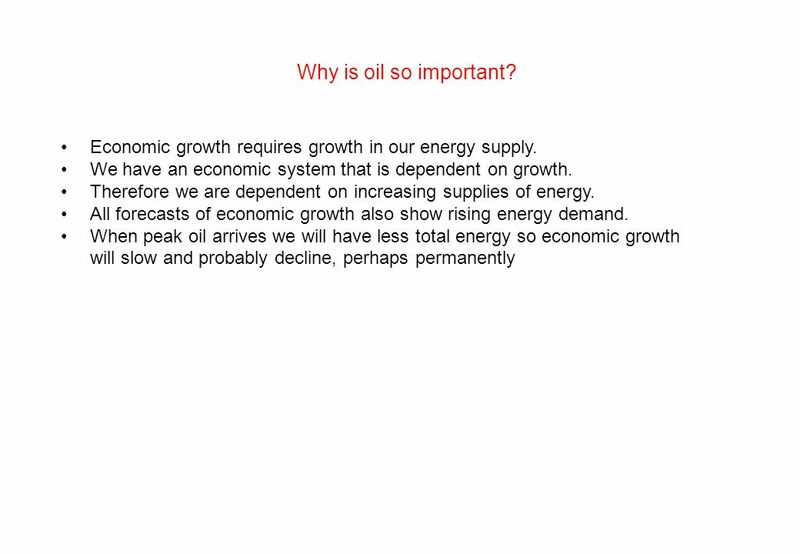 15 Why is oil so important? How many men does it take to push a car? A tank of petrol contains 8,000 human hours work! If you worked for 8 hrs/day, 52 weeks a year, 7 days a week that equates to about 3 years’ work. Most of us take for granted the amount of energy we have at our disposal instantly, everyday. 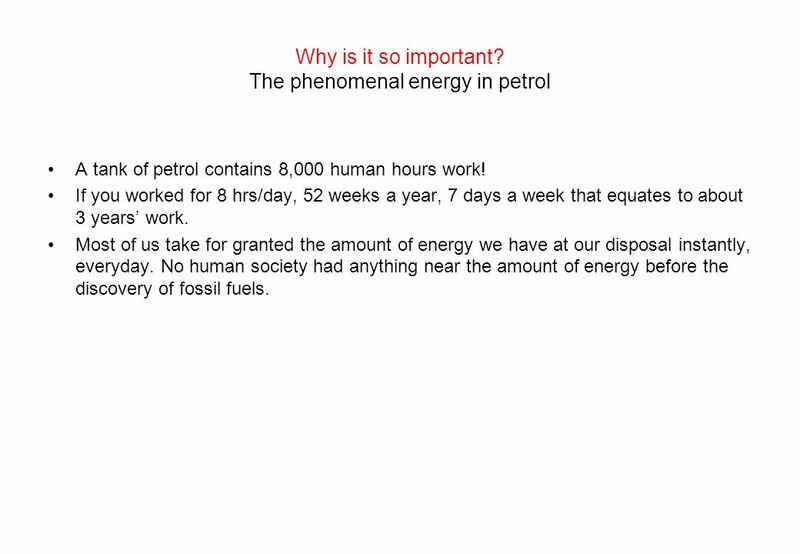 No human society had anything near the amount of energy before the discovery of fossil fuels. Additional points (If you imagine pushing a car 250 miles into a hurricane – at 70mph it would take a year for teams of 4 people to be constantly pushing the car to do the same work as one tank full) 95% of our transport is fuelled by oil. There is no replacement that is as convenient, high density, and safe. 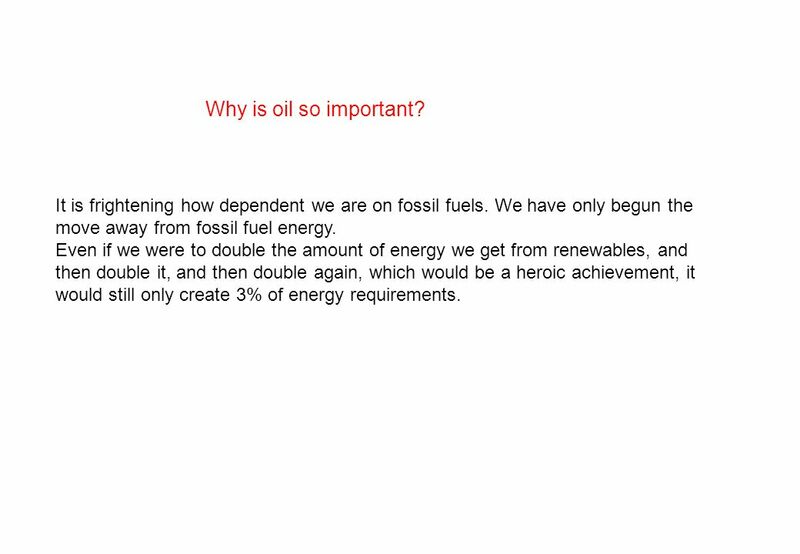 18 Why is oil so important? 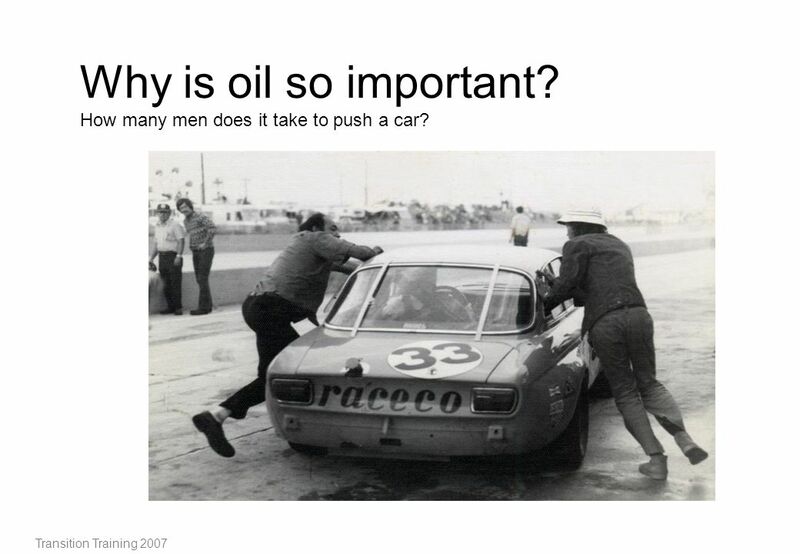 What do we use oil for? Our entire way of life, and a bewildering array products are reliant on oil. Transport is only the beginning of our oil use. 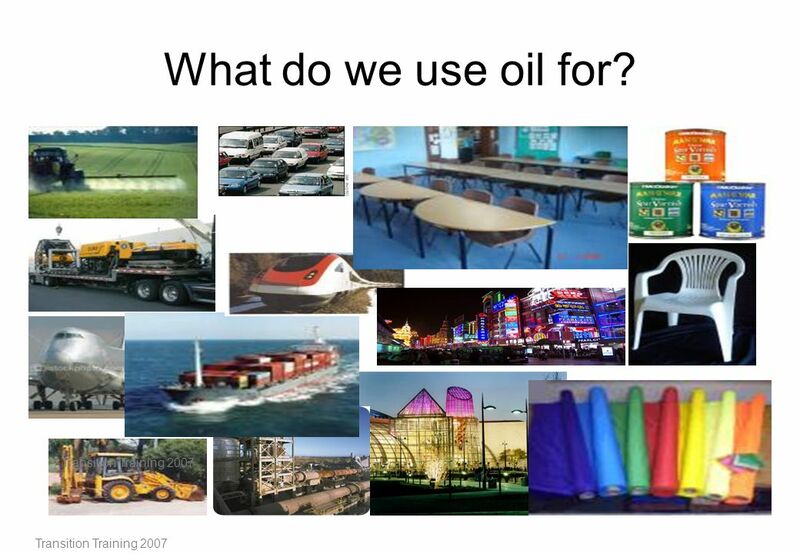 Many products are derived from, or use oil or gas as their raw material. Plastics, synthetic fibres, drugs, laminates, paints, ink… the list is endless The so called ‘Green revolution’ , modern agriculture depends on oil. Fertilisers and pesticides are made from oil and natural gas, tractors and machinery use it, irrigation requires huge amounts of energy and this is before food miles, processing, and storing, cooking, and packaging and retailing are taken into account. Industry and even the service sector use huge amounts of energy. The carbon dioxide cycle is a natural one ,and one that has been in dynamic balance and undergone many fluctuations and cycles over millions of years. There is a balance between the seas and the land and the atmosphere. Carbon is locked up in the seas in plankton and other marine life, and dissolved in the water. 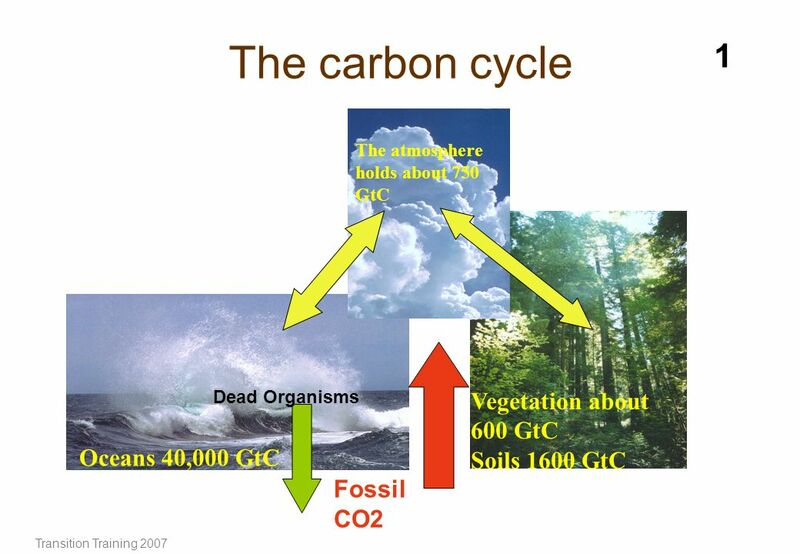 Carbon is also locked up in plant matter on the earth (active carbon cycle), and in fossil deposits (inactive carbon cycle) of oil, natural gas, and coal. The destabilising factor in the carbon cycle is that we have taken the locked up (inactive) carbon from fossil fuels and put that carbon in the atmosphere. 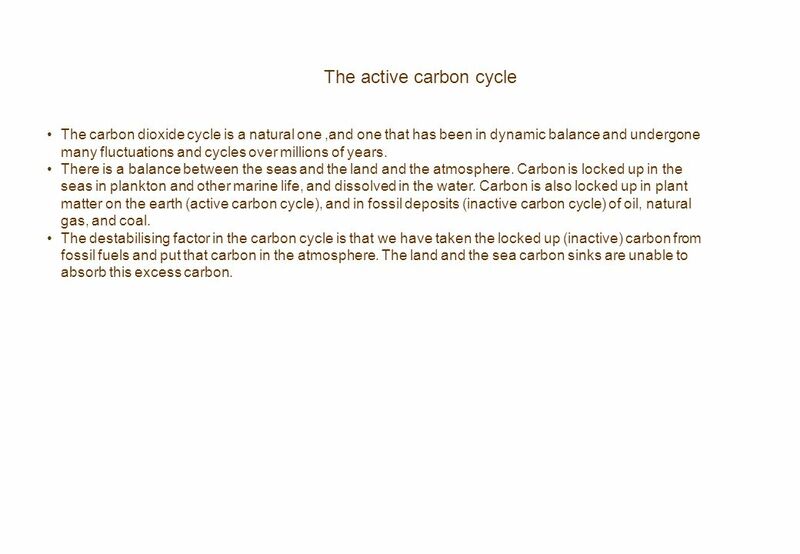 The land and the sea carbon sinks are unable to absorb this excess carbon. 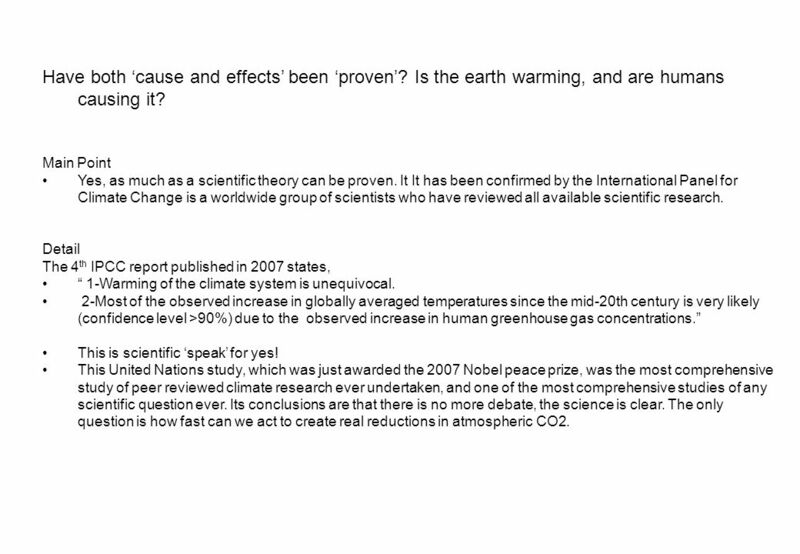 24 What is causing Climate change or Global Warming? Define Climate Change The term "climate change" is sometimes used to refer to all forms of climatic inconsistency, but because the Earth's climate is never static, the term is more properly used to imply a significant change from one climatic condition to another. 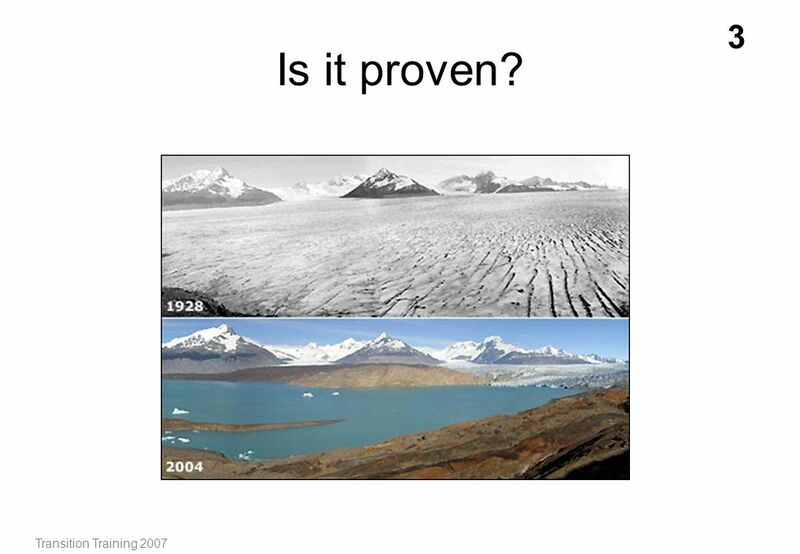 What is causing Climate change or Global Warming? Rising human made CO2 concentrations in the atmosphere. It this a theory? Yes Why? Because it is trying to establish two ‘cause and effects’. 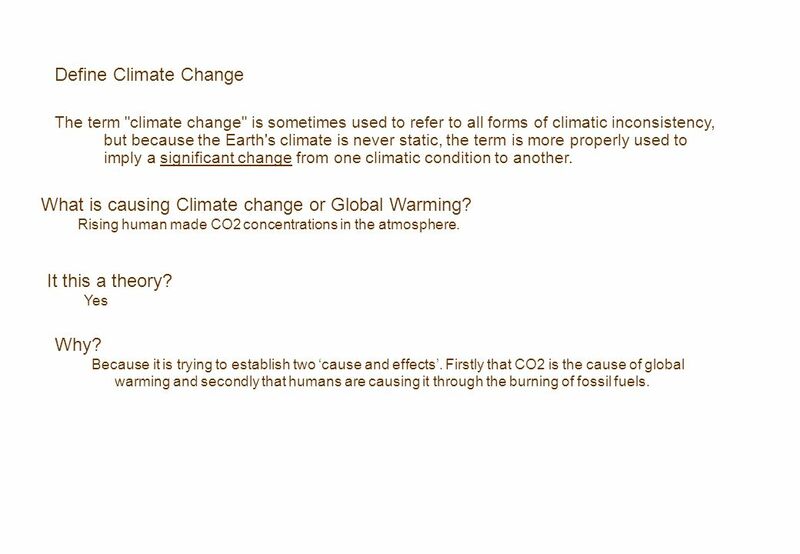 Firstly that CO2 is the cause of global warming and secondly that humans are causing it through the burning of fossil fuels. Have both ‘cause and effects’ been ‘proven’? Is the earth warming, and are humans causing it? Main Point Yes, as much as a scientific theory can be proven. It It has been confirmed by the International Panel for Climate Change is a worldwide group of scientists who have reviewed all available scientific research. Detail The 4th IPCC report published in 2007 states, “ 1-Warming of the climate system is unequivocal. 2-Most of the observed increase in globally averaged temperatures since the mid-20th century is very likely (confidence level >90%) due to the observed increase in human greenhouse gas concentrations.” This is scientific ‘speak’ for yes! This United Nations study, which was just awarded the 2007 Nobel peace prize, was the most comprehensive study of peer reviewed climate research ever undertaken, and one of the most comprehensive studies of any scientific question ever. Its conclusions are that there is no more debate, the science is clear. The only question is how fast can we act to create real reductions in atmospheric CO2. 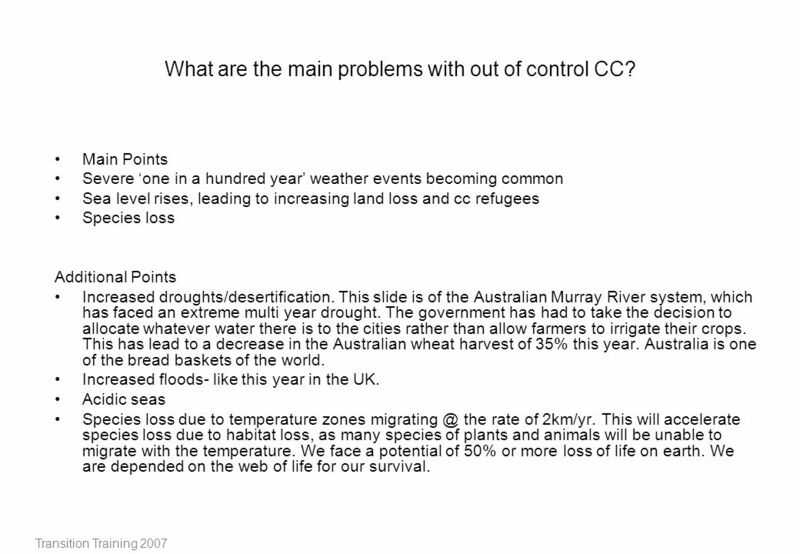 27 What are the main problems with out of control CC? 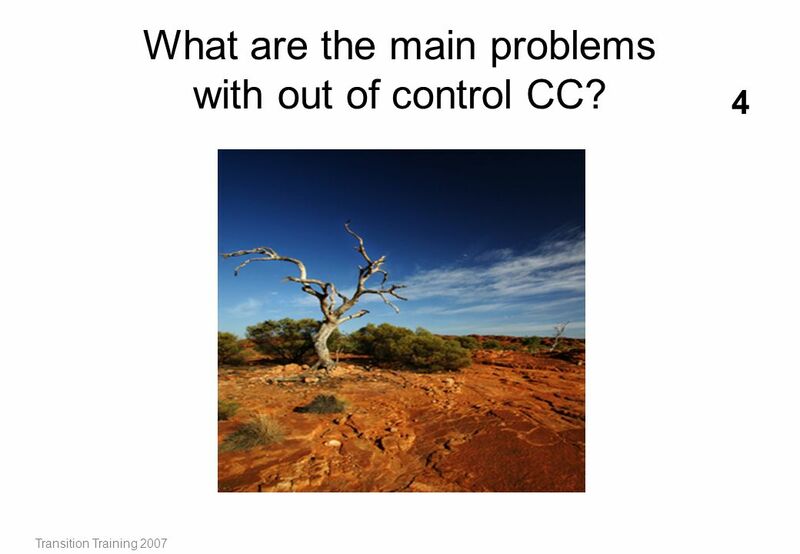 28 What are the main problems with out of control CC? 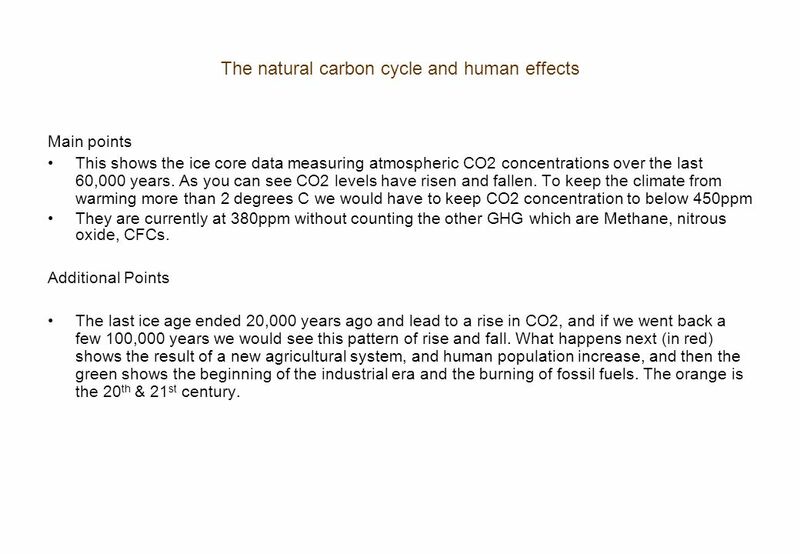 Main points This shows the ice core data measuring atmospheric CO2 concentrations over the last 60,000 years. 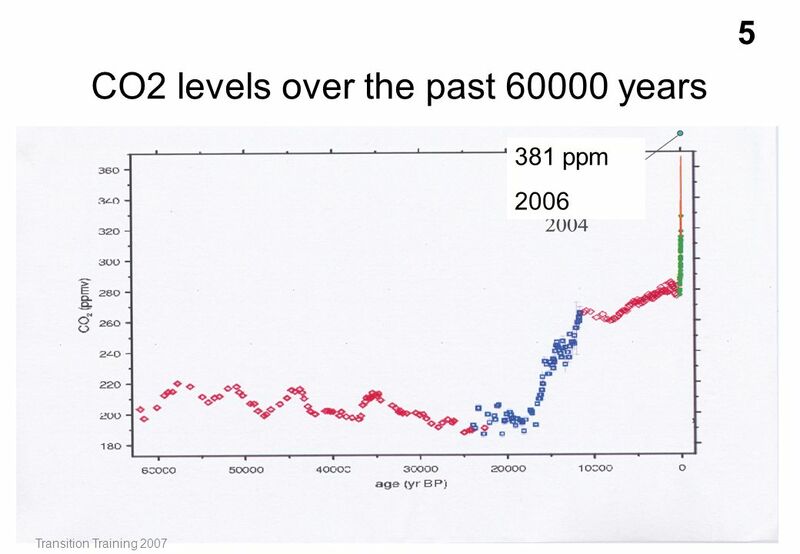 As you can see CO2 levels have risen and fallen. To keep the climate from warming more than 2 degrees C we would have to keep CO2 concentration to below 450ppm They are currently at 380ppm without counting the other GHG which are Methane, nitrous oxide, CFCs. Additional Points The last ice age ended 20,000 years ago and lead to a rise in CO2, and if we went back a few 100,000 years we would see this pattern of rise and fall. What happens next (in red) shows the result of a new agricultural system, and human population increase, and then the green shows the beginning of the industrial era and the burning of fossil fuels. The orange is the 20th & 21st century. Once global temperatures rise to certain levels positive feedback loops will cause further releases of greenhouse gases, leading to runaway climate change On the best evidence we need to keep temperature rises to less than 2* C. Emissions already made have not yet had their full impact – so we are perilously close to reaching this even if we reduce emissions dramatically now. 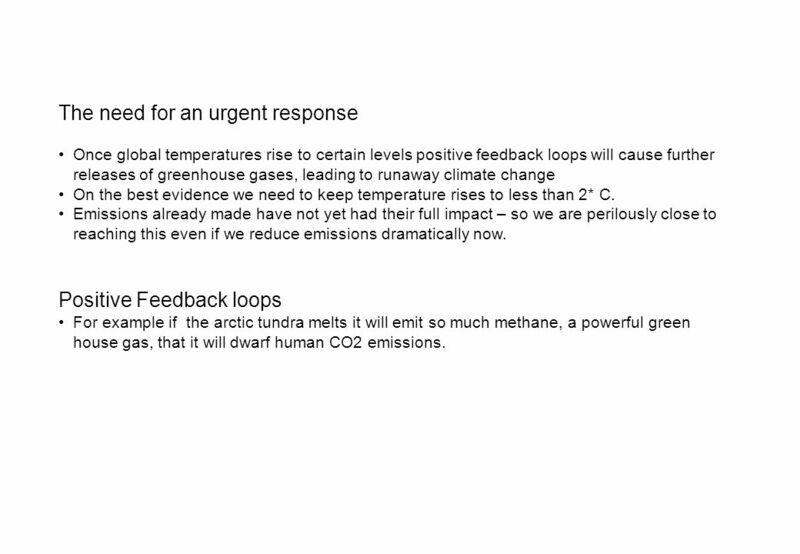 Positive Feedback loops For example if the arctic tundra melts it will emit so much methane, a powerful green house gas, that it will dwarf human CO2 emissions. 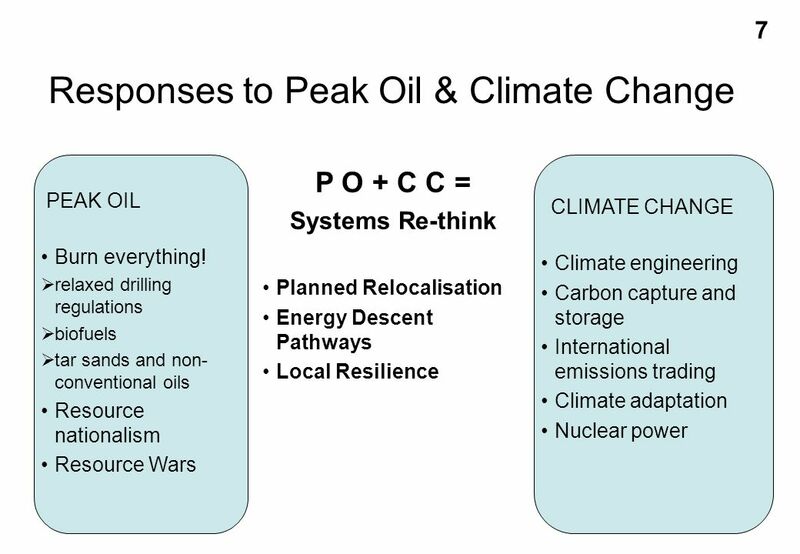 7 Responses to Peak Oil & Climate Change PEAK OIL Burn everything! relaxed drilling regulations biofuels tar sands and non-conventional oils Resource nationalism Resource Wars P O + C C = Systems Re-think Planned Relocalisation Energy Descent Pathways Local Resilience CLIMATE CHANGE Climate engineering Carbon capture and storage International emissions trading Climate adaptation Nuclear power In terms of devising mitigation actions, it’s important to look at Peak Oil and Climate Change together. If you look at them in isolation, you get one dimensional solutions. On the one hand, Peak Oil on its own might demand (as suggested by the Hirsch report for the US administration) all sorts of actions to maintain “business as usual” On the other hand, Climate Change can often prompt actions that address carbon emissions at a global scale (though nuclear power is questionable even if you focus purely on its carbon equation). 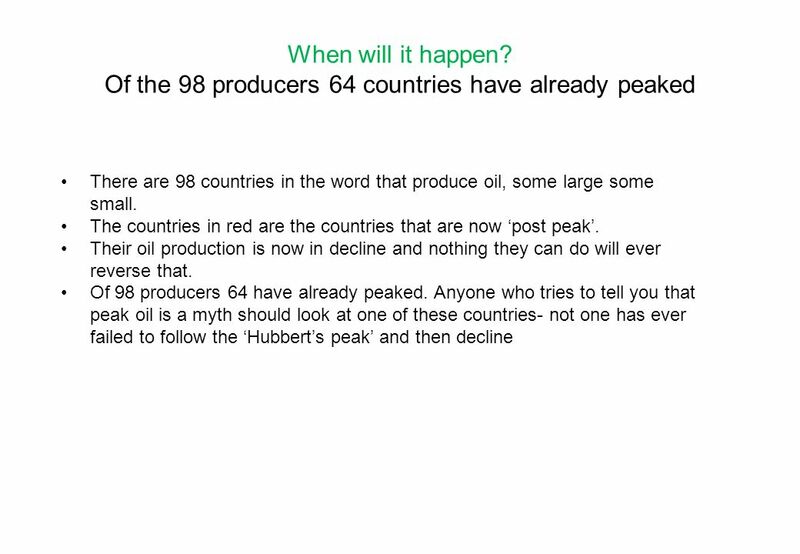 So where does "peak oil" leave the Stern review? The intuitive answer is that running out of oil should at least be good for climate change, but the reverse could be true. A growing shortfall of global oil production is likely to send the crude price skywards, obliterating Stern’s grand bargain. The kind of long-term impacts attributed by Stern to climate change could arrive much sooner. With the economy reeling, it will be far harder to fund the expensive new energy infrastructure we need to combat climate change. And faced with the likely re-emergence of mass unemployment, the political priority may well shift from, say, maintaining a high price on carbon, to keeping the lights burning at lowest cost. True, recession would mean we would emit less CO2, but since we have to cut by at least 80+ percent by 2050 (or much sooner according the scientists looking at the effects of feedback mechanism), economic contraction is hardly the optimal way to achieve the target. He also seems to ignore limitations to the availability of uranium and the carbon costs of this “clean” fuel. He’s also working towards a CO2 concentration of 550ppm, whereas Hansen & the Tyndall Centre says we must keep it to 450ppm. However, when you bring them together, the imperative is to build local resilience, address the vulnerability of communities to disruptions in their supply lines and all aspects of national and international grids for energy, money, medicine and food, in particular. The Transition model focuses wholeheartedly on this middle ground. And to those who may think of this as a retrograde step – recovering a sense of neighbourhood is not a backward move. 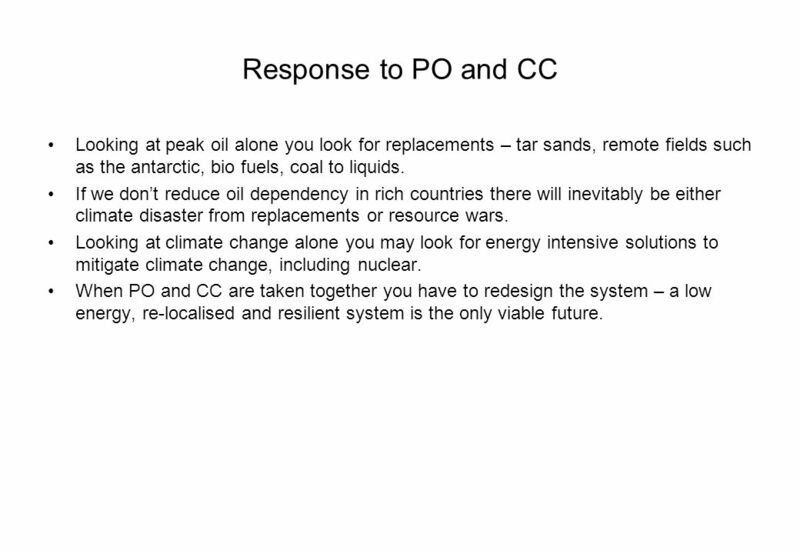 34 Response to PO and CC Looking at peak oil alone you look for replacements – tar sands, remote fields such as the antarctic, bio fuels, coal to liquids. If we don’t reduce oil dependency in rich countries there will inevitably be either climate disaster from replacements or resource wars. Looking at climate change alone you may look for energy intensive solutions to mitigate climate change, including nuclear. When PO and CC are taken together you have to redesign the system – a low energy, re-localised and resilient system is the only viable future. 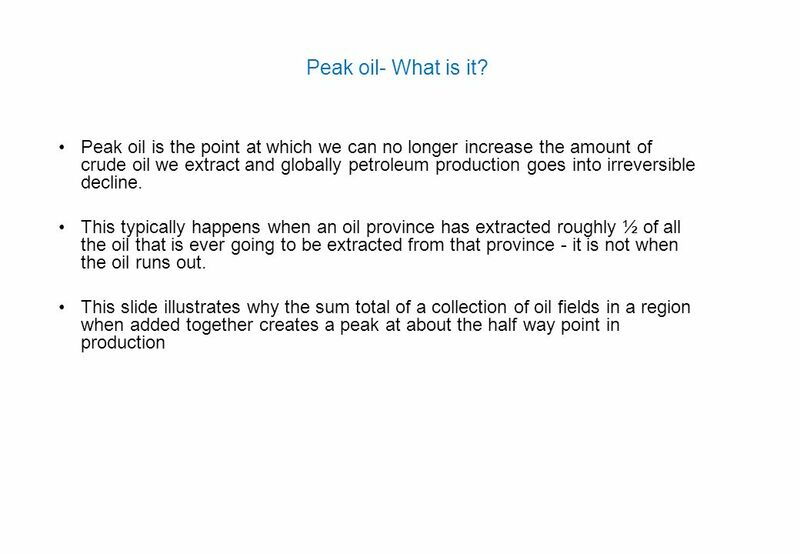 Download ppt "Peak oil Transition Training 2007." 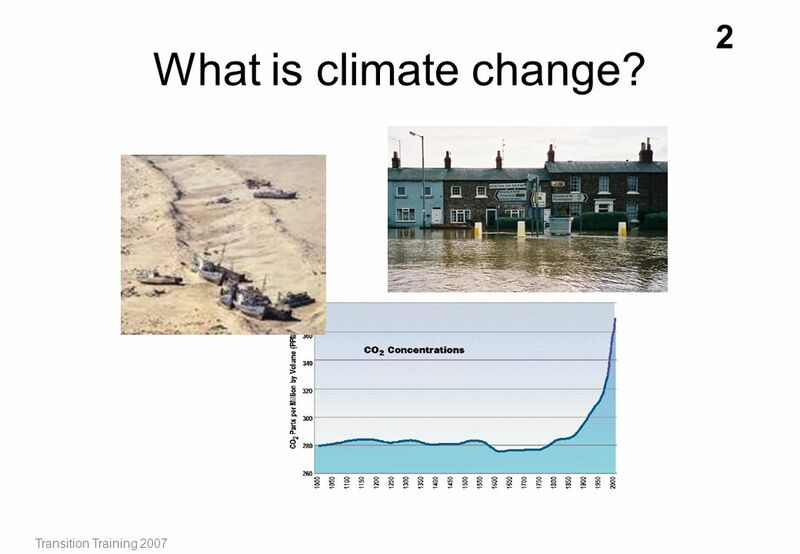 M ODULE #2: C limate Change & Global Warming …Science & Sources of Greenhouse Gas (GHG) Emissions. Michael B. McElroy ACS August 23rd, 2010. Thank You! Locally Integrated Food & Energy L.I.F.E. David Yarrow sustain and retain wealth for common good /biochar /CarbonFarming /terracharge. 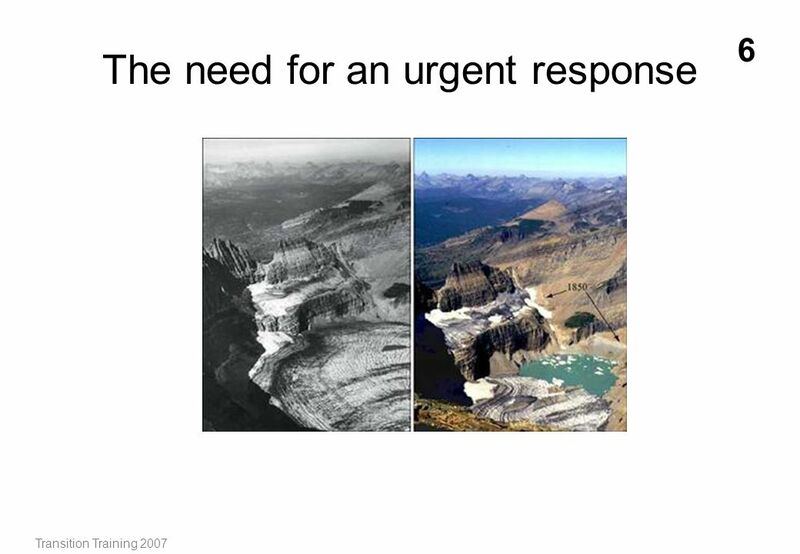 5/16/2015The NEED Project: 30 Years of Energy Education1 The Basics of Climate Change. 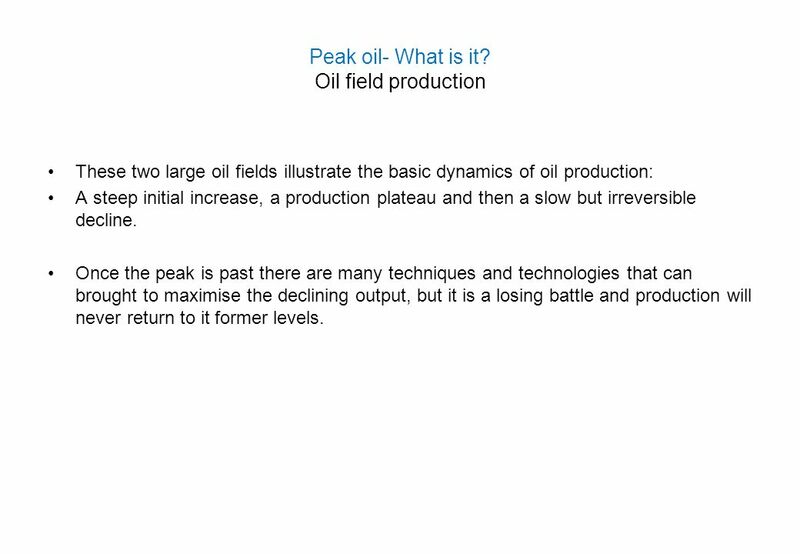 Transition Training and Consulting 2010 Peak oil 1. Global Warming ‘Political hype or reality?’ The Fernhurst Society - 5 April John Clement. Future climate (Ch. 19) 1. Enhanced Greenhouse Effect 2. CO 2 sensitivity 3. Projected CO 2 emissions 4. Projected CO 2 atmosphere concentrations 5. What.